It’s always something we need more of, and when it comes to taxes, the April 15 deadline always seems to creep up out of nowhere. 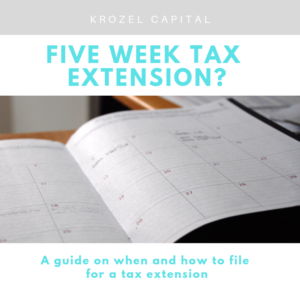 How about an extra 5 weeks to file your tax return this year? Well a pair of House Democrats have actually introduced a bill to do just that. The ‘Taxpayer Extension Act’ was introduced by Reps. Sean Casten D-Ill. and Lauren Underwood, D-Ill. If passed, your 2018 tax filing would not be due until May 20, 2019. They chose 5 weeks as this was the amount of time the government was shut down earlier in the year. So what if this doesn’t pass? Why File for an Extension? Remember that filing an extension only gives you an extension to FILE your taxes, not to PAY your taxes. So if you file an extension and still end up owing tax once you do file, you will have to pay both interest and the late payment penalty. So what does an extension actually do then? The extension gets you out of paying the late filing penalty and helps keep you in good standing with the IRS. You can read more about the late penalties here. Note that interest is updated quarterly by the IRS and is currently at 6% for Q2 2019. How to file for an extension? There is also an automatic two month extension for U.S. residents who live overseas. That’s right! Those living abroad have until June 15 to file. If you do owe the IRS, the tax due will start collecting interest on April 15 (but no late payment penalty if paid by June 15). Need additional time? Form 4868 can be filed by June 15th to provide an extension until October 15th. If you moved overseas in 2018, you may need a different type of tax extension. That goes beyond the scope of this article, but if you are in this position and have not consulted with a tax adviser, you may want to contact us. We work with a lot of expats and can help get your sorted. If you need additional time, you can get up to a six month extension until October 15th. However, if you expect to owe money to the IRS, you still need to calculate what you owe and pay by the April 15 deadline (or incur penalty and interest once you do file and pay). Serving/Working in a Combat Zone? If you are in the military or a civilian working in a combat zone in support of our military you also qualify for an automatic extension (and this includes extensions to pay as well!). The IRS has a great Q&A page about extension of the tax deadline for combat zone service here. Foreign Bank Account? Don’t Forget the FBAR. If you have any non US bank accounts you may be required to file FinCen Form 114 (aka ‘FBAR’). This form is due April 15th, but an automatic extension is provided until October 15th…so really, the hard deadline is October 15th. This is separate from your tax return and can be filed online here. So bottom line, keep yourself in good standing with the IRS and file an extension if needed. If you need help filing your tax return(s) this year, but know you won’t make the April or June deadline, don’t wait to contact us. We can help file your extensions and get you on-boarded, so that when you are ready the process will be easier and less ‘taxing’!